Charles Ryan's Flying Adventure: Scooting home with the airline's Boeing 787-8 Dreamliner! Scooting home with the airline's Boeing 787-8 Dreamliner! Welcome to my Final Trip Report on Scoot! I have covered quite a bit of this airline so for my future flights with this airline, unless its something spectacular, I won't be doing any more reports. For my past trip reports with this airline, you can check out the links below. Originally my flight was supposed to be on the 30th January, and aircraft type was scheduled to be Boeing 787-9 Dreamliner. As the time approached the date, I received a notification by the airline that my flight was cancelled and was changed to a day later. I was fine with it but thinking back I should have changed to another date to test the airline's efficiency. I heard lots of complaints about the airline's service recovery, perhaps next time I should try it to discover myself. As for the aircraft type, I was slightly disappointed as I had flown the -8 series more times than the -9 and later on it turned out that my flight was full, thanks to the cancellation I guess. I am puzzled, since the Saturday's flight was cancelled, shouldn't the airline used a bigger aircraft, the -9 for this instance? Perhaps shortage of -9 aircraft on that day, who knows! I like this photo from YunJie Lee who photographed this at Seoul Incheon Airport. After a disappointing stay at a highly rated hostel, I made my way to the nearby LRT to take the train to Terminal 21. Why was I disappointed? Mainly due to the poor service from check-in staff, and what was worse is the drilling noise which woke me up early in the morning. I won't go back there any time soon definitely. I had a delicious lunch at one of the Japanese restaurants at Terminal 21 Shopping Mall. I like to give this motorbike a test drive. This caught my attention while I was making my way out of Central World Shopping Mall. There was a taxi stand with many folks queueing up. After 15 minutes, I decided not to wait and take a taxi somewhere else. Fortunately, I caught one that a passenger just alighted from, outside the hotel, I asked him whether he was taking passengers and would drive to DMK airport, he agreed and I was on my way sooner than I thought. Initially there was slow traffic at the initial part of the journey but once we made our way to the express way, it was a smooth passage to the airport. After passing through 2 tolls, we reached the airport. Unlike my previous experience, it was a pleasant check-in this time. By the time I reached the queue, I was the 8th person in line but 5 counters were opened so check in was a quick affair. 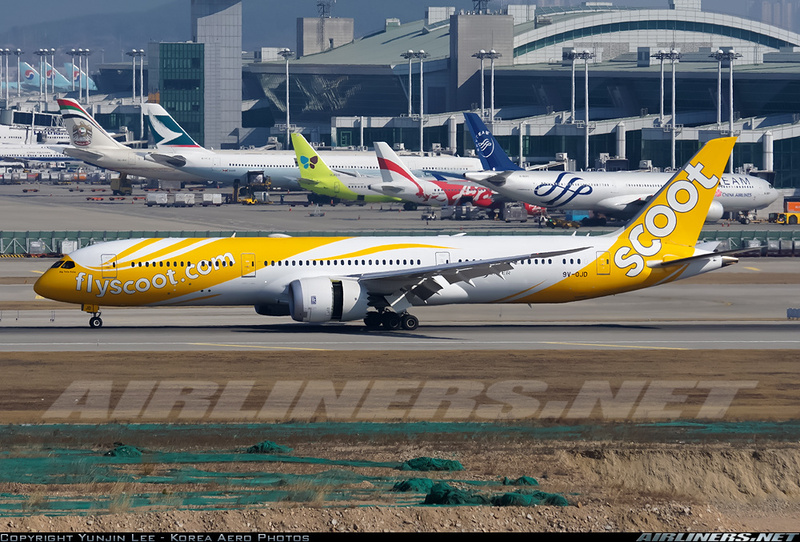 Do note that Scoot's web check-in applies only for flights flying out of Singapore (Home base). For foreign cities, normal check-in procedure only. Welcome to Bangkok DMK Airport! The terminal isn't big so finding your airline's check-in counter doesn't take long. Thai Lion Air - We make people fly! R Airlines - when is it going to start up? I saw the airline's A320 aircraft before but it has since disappeared. Many of us are wondering, what's going on with this airline? Before checking in, I did some plane spotting and met a German aviation enthusiast! This was what I saw at that time! After that, it was about 3 hours before departure, I decided to head to the check-in counters to do my check in so that I could more spotting at the air side. There were already passengers queueing up. Once I was done, I made my way to the air side. Spotted a set of airline crew along the way. Did a quick check on Flightradar24, 9V-OFB was on its way to DMK Airport. I am glad that it wasn't OFA. Once at the air side, I went to enjoy some plane spotting. Great place for plane spotting and photography! This Nok Air's Boeing 737-800 was heading to Ho Chi Minh City. While waiting, I decided to get myself a drink and a hot dog with American cheese. Welcome back on Scoot, Mr Charles! Unfortunately, this set of crew was a disappointment especially after experiencing a great set of crew on my previous flight with Bangkok Airways. I made my way to seat while passing by a couple of crew who seemed to wish they were somewhere else. Putting that aside, I noticed a windowless seat near the rear of the aircraft, and I knew the outcome. Fortunately, it isn't as bad as seat 7A. I only have to lean forward to access the window. Fortunately, this is a night flight so not a big deal. I asked the crew whether the flight was full and could I change seat. He had no idea about the load and asked me to wait until the door closed. Unfortunately, it turned out to be an almost full flight and the seats beside mine were taken up by 2 Singaporean youngsters. Windowless seat but not as bad as seat 7A, you can check it up on this trip report. I was sitting quite close to the rear. Waiting for the rest of passengers, hoping for the seats beside mine to remain vacant. Windowless seat at the other side, row 37K. No rainbow lighting on arrival, I was disappointed. I didn't take that many photos on this flight, so you can check out more of this airline's Economy class photos on this trip report. Flight was uneventful. In-flight service was normal, nothing fantastic. For most of us, we were asleep since it was pretty late. For the BOB service, I skipped it as I wasn't hungry. 2 hours of flying went past fast and we touched down smoothly at Changi Airport. This point, I could do some comparison between this aircraft and the Airbus A350-900. Engine start-up is slightly nosier than the A350, but the flaps setting is definitely quieter on this aircraft. Sound is audible, but isn't as loud. Once clearance was given, we taxied to our assigned runway. Take off was powerful but slightly nosier than the A350. Still quieter than the Boeing 777 though. We made a turn and enjoy some view of the city before flying over the South China Sea. At this point, we started our descend into Singapore. The familiar sight of these ships and I know for sure, we were on approach to runway 02. SMRT's Train Depot at Tanah Merah. We were within seconds before touch down. Landing was smooth and we taxied for a good 15 minutes before reaching to our gate at Terminal 2. Flying with Scoot has its own advantages and disadvantages. 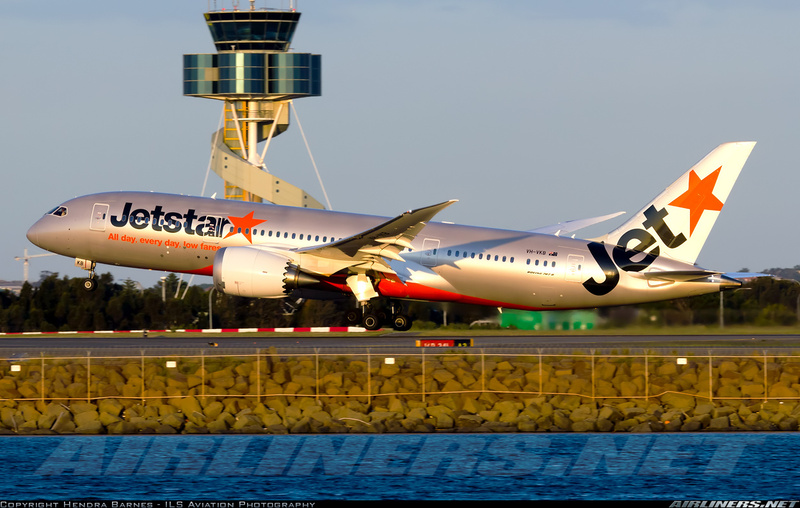 The advantage is it is now working with Tigerair flying to numerous destinations in Asia and Australia so combining both airline's network, you have more choices than before especially connecting flights from Australia to other cities. Secondly, it operates a fleet of Boeing 787 Dreamliner with just a spare aircraft: the Boeing 777-200ER which would be retired some time this year according to a reliable source, the new generation aircraft is definitely more comfortable to fly on than the A320 or b737 narrow-body aircraft. Thirdly, airfares in general is cheaper than flying on Premium carriers and you pay for what you need, options that you don't need, you don't have to pay for them (For example: In-flight meal, good seats or entertainment (ScootV or WiFi)). Lastly, if you are a Krisflyer (Singapore Airlines' mileage program) member, you can earn or redeem miles on Scoot and Tigerair, that's provided you pay more for the airfare (earning miles) and redeeming miles is subjected to availability. As for the disadvantages: The airline operates the 787 Dreamliner aircraft at a high utilisation rate so if one or two aircraft are grounded due to technical problem or weather issues, and depending whether there are spare aircraft on the ground, your flight may get delayed. Airline is not well known for its service recovery and that may become a disadvantage for you. Secondly, flight timing on certain routes are not ideal and usually for those flights, air fares are cheaper. Are you willing to sacrifice the inconvenient flight timing in order to save money? Thirdly, in-flight meals are pretty pricey and you can't enjoy outside food on board. Overall, I am quite satisfied with my experience with this airline. 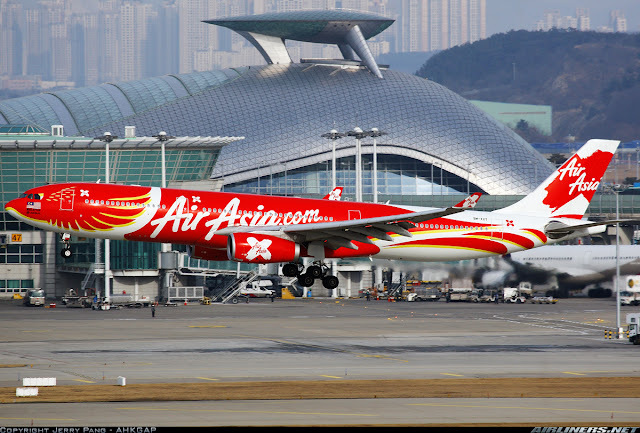 One advantage it has over its competitors such as Air Asia X is the aircraft type. The 3-3-3 on Economy Class is definitely more comfortable on the 787 Dreamliner than the A330-300 of Air Asia X. What's coming up next for me? Airlines: Thai Airways, Jet Airways, Vietnam Airlines, Cebu Pacific and Philippines Airlines. Stay tuned for the trip reports! Thanks for reading, hope you find this information useful!